The Ural Mountains, the most ancient mountain range in the world, hide numerous secrets and many traces of past civilizations. In Yekaterinburg and its surroundings (1,660 kilometers east of Moscow) there are a multitude of ancient objects that have captured the interest of archaeologists and travelers from both Russia and abroad. Here are the six most beautiful places for archaeological tourism if you visit Yekaterinburg. 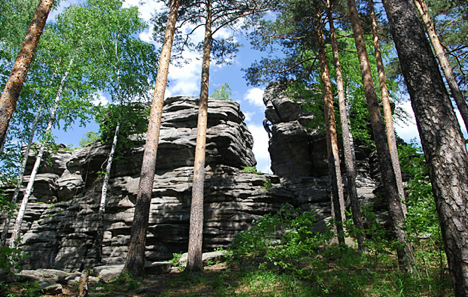 The Petrogrom rocks are high granite buttes crowning the top of the homonymous mountains about 30 kilometers northwest of Yekaterinburg. There used to be an ancient mining and metallurgic complex here where humans were living as early as the eighth century BC. They were blacksmiths of the Itkul archaeological culture, who used to smelt copper, obtain silver and employ an original method to separate nonferrous metals in the melting process. Scholars have found 18 furnaces in the Petrogrom rocks. On the top of the rocks you can still see their remnants in the form of small round cup-shaped indentations. The rocks are natural monuments of archaeological and botanic interest and the granite is 300 million years old. According to one of the versions, they are called Petrogrom because they attract lightning. According to another, they are named after Pyotr Gromoverzhets, the patron saint of blacksmiths. While here you can enjoy a wonderful view on Lake Isetskoe. A walk on the Petrogrom rocks can be combined with an excursion to nearby Chertovo gorodishche (see below) or the Ural dolmens. Approximately 25 kilometers northwest of Yekaterinburg there is a cultish place called Chertovo gorodishche (Devil’s Settlement). At first glance it just appears as a pile of strange rocks on a mountaintop that look like impregnable towers. However, this place is a monument to ancient metallurgy and a sacrificial place for the people of the early Iron Age and the Middle Ages. On top of the buttes and in the ravines between them archaeologists have found the remnants of burnt bones, ceramics dating back to the early Iron Age and copper plates once used to make weapons and jewels. The wild beauty of this corner of the Ural countryside stimulated its association with dark forces, hence its name. According to some estimates in the Middle and Southern Urals some 200 or more dolmens have been found that are probably older than the pyramids of Egypt. The megalithic tombs closest to Yekaterinburg are located to the north in the satellite-city of Verkhnyaya Pyshma, close to the head of the Iset River. They were first discovered in the forest in 1958. These enigmatic constructions have various forms and dimensions and are undoubtedly manmade. Near the town of Severka, about 27 kilometers west of Yekaterinburg, there are countless picturesque places. The most amazing ones are the Severka petroglyphs (Severskie pisanitsy), which preserve a unique “art gallery” of the Stone Age. On three out of five slabs, at a height of 1.2 meters off of the ground, a complete picture of the ancient world has survived with images of human-like beings, water birds and reindeer. Archaeologists say that such bird images can also be found on the pottery from the third millennium BC. The Severka petroglyphs were only discovered in 1985. The Palkino stone tents are archaeological monuments in Yekaterinburg’s western edge. Man lived here from the Mesolithic era until the 18th century and the very early finds date back as far as 10,000 years BC. Here archaeologists have found the traces of an ancient Ural culture: settlements, a shrine, two burial grounds and a large sculpture depicting the head of a female elk and furnaces. At the beginning of the 20th century a factory director by the name of Sigov found the so-called Palkino treasure here, which is currently stored in the Hermitage. Next to the furnace, under some big granite “pancakes,” there were two copper idols. The ritual artifacts had been enveloped in fragments of pulverized skin and wrapped in perfectly conserved birch bark. The Shabrovsky tents geological monument (15 kilometers south of Yekaterinburg) is called “snake’s hill” by locals. The French archaeologist Joseph de Baye discovered a ritual settlement of ancient men where rites of sacrifice took place from about the seventh century BC to the fourth century AD on the rocks of the tents and next to the foot of the hill.